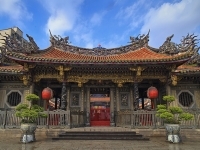 Longshan is one of the most popular temples in Taipei. Dedicated to Guanyin the Goddess of Mercy, it is an excellent example of the architecture commonly seen in Taiwan's older buildings. Built in 1738 to be a place of worship for Chinese settlers, its troubled history has seen it destroyed several times. To date, it has suffered damage by earthquakes, fires and even American bombers during World War II. Undaunted, Taipei residents have rebuilt it each time, and it remains very much in use.